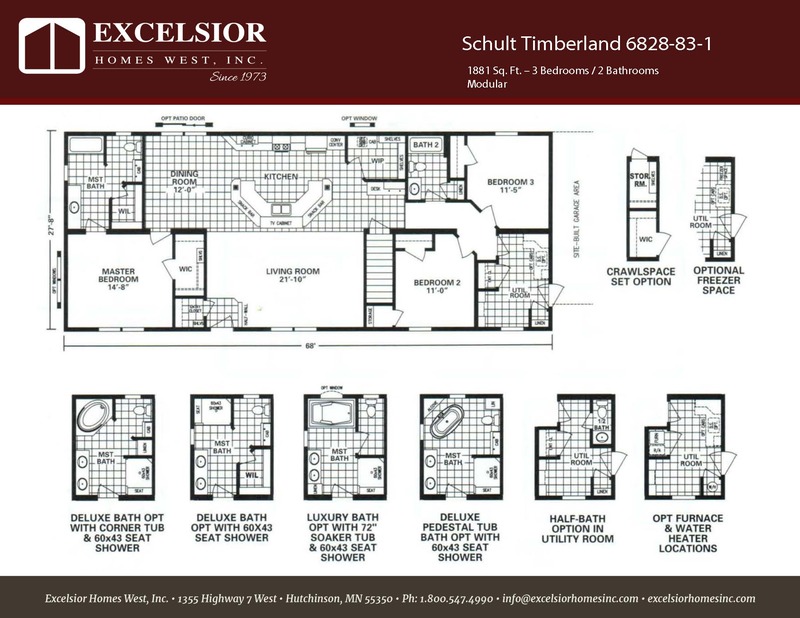 Schult Timberland 6828-83-1 | Excelsior Homes West, Inc.
Are you looking to build a rambler style home in Minnesota or surrounding states? If so, the Schult Timberland 6828-83-1 may be the perfect floor plan for you! The Schult Timberland 6828-83-1 is a rambler style floor plan. Schult Homes of Redwood Falls, Minnesota can build this home as either a modular home or manufactured home. This spacious home has approximately 1881 square feet and has three bedrooms and two bathrooms. Excelsior Homes West, Inc. is your source to customize a Schult Home and get the design you are looking for. If you like the Schult Timberland 6828-83-1 we can price this home for you with the options and upgrades you want. In our quote we will include delivery and installation of the home at your location in Minnesota, North Dakota, South Dakota, and surrounding areas. The Schult Timberland 6828-83-1 has many options and upgrades available. We can build this floor plan as a Modular or Manufactured Home. As with most of our floor plans, the Schult Timberland 6828-83-1 can be built as either a modular home or manufactured home. As a modular home, you have the choice of a basement or crawl space foundation. Choose from a selection of standard options and make desired upgrades. To add more light, there are options to add some additional windows and under cabinet lighting. Give us your ideas and we will do our best to customize a Schult Modular or Manufactured Home to fit your housing needs.